I couldn't thing of category for the following photos, so I just put them here. Enjoy. This is where my love for cars started. 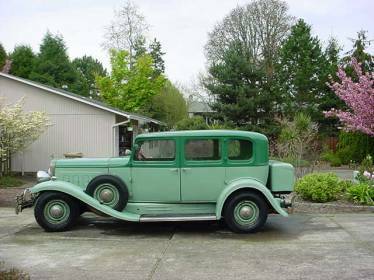 It is a 1933 Franklin Airman, an air cooled car that thrived from the early 1900's to 1934. Like so many other car manufacturers, the Great Depression put an end to them. This was my family car when I was born, and was the car I learned to drive in. It remained our family car until 1962 when I drove it into my parents garage for the last time. It stayed there until 1986, when I moved my parents nearby so I could look after them in their twilight years. After their passing, the car stayed in my garage for several years. I hoped to restore it someday, but time and money were the enemy. I decided to sell it to someone who had more of each than I did, and who would restore it to it's original grandeur. It was hard to see it go, but necessary. Someday I hope take a ride in it again, but this time as a passenger. After a few hundred miles of pretty hard driving, the camshaft went flat. It was probably pretty shot when I took the engine out of the Pinto, but it seemed to run pretty well. This happened just a few days before a Lotus Club Track Day, and I really wanted to drive around Portland International Raceway (PIR). There wasn't enough time for a real engine overhaul, so my 14 year old nephew and I removed the cam cover and saw the inside covered with a film of what looked like silver paint. It was the very fine metal shavings suspended in the engine oil. We couldn't just pulled the cam and stick in a new one because all that metal would certainly wipe out the whole engine, not to mention the new cam. Here we are removing the oil pan so we could flush the engine with solvent. We scrubbed the top and everywhere we could reach in the crankcase and then flushed the top and crankcase with clean solvent. Then we replaced all the rod and main bearings while laying on the ground (not fun). Then we buttoned it up, and crossed our fingers. Here it is at PIR just a few days after installing the new camshaft. After the engine work, I put a "FilterMag" oil filter magnet on a new oil filter, and drove the dickens out of it for a couple of days. I putt about 250 miles on the "new engine" and then did an oil and filter change. The magnet was moved to the new filter, just in case. I cut the filter apart after removing it, and was surprised to see how much metal the magnet had trapped. I recommend it for any engine (http://www.filtermag.com). Running at PIR was great fun. Hot laps on a truly international race track is an experience everyone should have. It's great to be out there with other exotic vehicles - everything from little clubman vehicles like mine, to Formula 1 cars. Wow. One of the really neat things about running at PIR was the fact that a car I had built actually passed tech inspection at a real race track. Pretty cool. Notice the lettering on the side of the car. It proves (to IRS) that we really do use the car to promote our business. This is the 2006 All British Field Meet, the day after running at PIR. There must have been over a thousand cars on display. I had no intentions of winning any prizes with a car that still need paint and interior niceties. Even so, I was surprised by winning Peoples Choice 1st place for my class. I think it must have been a pity vote from people who had some idea of the amount of time it takes to build a car from scratch. Here we are at Grand Prix Imports. It was the starting point for a CLNW fun run that took us from Wilsonville, Oregon to Silver Falls State Park and back over some interesting roads, a ferry ride across the Willamette River, a covered bridge, and even a wine tasting on the way home. The folks at Grand Prix Imports were kind enough to let us gather in their parking lot. This is the place to find some of the most exotic cars in the world. Check them out, and bring your checkbook (bring several of them).